WELCOME NYFW – New Location – Same Excitement!! As Mercedes Benz Fashion Week Fall 2010 starts at the same time it is an ending of an era. Since 1993 Bryant Park has been the home to New York Fashion week making the park the heart of the garment district and of Manhattan itself. When it first began 35 of America’s best fashion designers had partaken in the festivities. This season there are 250 designers showing at fashion week on and off location. 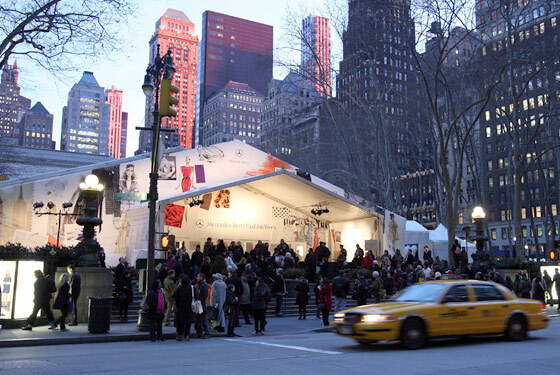 For those of you who have been in the Tents at Bryant Park you would know that to have every designer who shows during fashion week under one roof throughout one week would be virtually impossible. This is the reason why NYFW will be moving to Lincoln Center’s Damrosch Park which is a 87,000 square foot space next season. IMG is hoping that this space will allow many more designers to show at fashion week instead of choosing to show their collections off site. I can truly understand why they have chosen to do this but at the same time I am extremely saddened by this big move. Whenever I pass Bryant Park throughout the year I get such a warm and exciting feeling in my bones that allows to me eagerly anticipate the upcoming fashion week season. I will greatly miss NYFW being in Bryant Park. I am just very happy to have made such great memories and to have had such wonderful life changing experiences under the fashion week tents of Bryant Park! AU REVOIR BRYANT PARK!! Alexander McQueen – A Fashion Design Icon Who Will Be Greatly Missed!